Oxygen XML Editor provides a view for managing and editing DITA maps. The DITA Maps Manager view presents a DITA map as a Table of Contents. It allows you to navigate the topics and maps, make changes, and apply transformation scenarios to obtain various output formats. By default, it is located to the left of the main editor. If the view is not displayed, it can be opened by selecting it from the Window > Show View menu. The DITA Maps Manager includes a variety of useful actions to help you edit and organize the structure of your DITA maps and topics. The actions that are available and their functions depend on the type of nodes that are selected in the DITA Maps Manager. If you select multiple sibling nodes, the result of the actions will be applied to all the selected nodes. If you select multiple nodes that are not on the same hierarchical level, the actions will be applied to the parent node and the child nodes will inherit certain attributes from the parent node. To open a submap in its own tab, simply double-click it (or right-click it and select Open). If you open a file with a .ditamap or .bookmap extension (from the Project view or a system browser), a dialog box is opened that offers you the choice of opening it in the DITA Maps Manager or the XML editor. Note: If you select the Do not show the dialog again option, it will always be opened in the method that you choose and you will not be asked in the future. However, you can reset this by selecting the Always ask choice for the When opening a map option in the DITA preferences page. Right-click a map file in the Project view and select Open with > DITA Maps Manager. If you have a DITA map file open in the XML editor, you can right-click the title tab and select Open in DITA Maps Manager View. By default, when a map is opened in the DITA Maps Manager, its index is automatically refreshed. You can disable this feature by deselecting the Refresh index when opening a map in DITA Maps Manager option in the Open/Find Resource preferences page. If your root map (main DITA map) references other maps (submaps), they can be expanded and you can navigate their content in the DITA Maps Manager, but the references within those submaps are not editable unless you open the submap separately in its own tab. The references within submap nodes are shown with a gray background. You can move topics or nodes within the same map, or other maps, by dragging and dropping them into the desired position. You can arrange the nodes by dragging and dropping one or more nodes at a time. You can arrange multiple topics by dragging them while pressing the Ctrl or Shift key. Drop operations can be performed before, after, or as child of the targeted node. Select the nodes you want to copy and start dragging them. Before dropping them in the appropriate place, press and hold the Ctrl key. The mouse pointer changes to a symbol to indicate that a copy operation is being performed. Select the nodes you want to move and drag and drop them in the appropriate place. You can move nodes between child and parent nodes by using the Promote (Alt + LeftArrow) and Demote (Alt + RightArrow) operations. Note: If multiple nodes are selected, the availability of the actions depends on the nodes that are selected. List of recently viewed DITA maps that can be selected to reopen them. Clear history - Clears the history list of the recently viewed DITA maps. Open - Allows you to open the map in the DITA Maps Manager view. You can also open a map by dragging it from the file system explorer and dropping it into the DITA Maps Manager view. Open URL - Displays the Open URL dialog box where you can specify a URL (defined by a protocol, host, resource path, and an optional port) or use the browsing actions in the Browse for remote file drop-down menu. Saves the current DITA map. Checks the validity and integrity of the map. Applies the DITA Map transformation scenario that is associated with the current map. Opens the Configure Transformation Scenarios(s) dialog box where you can edit or create transformation scenarios or associate a DITA Map transformation scenario with the current map. You can use this action to manually trigger a refresh and update of all referenced documents. This action is useful when the referenced documents are modified externally. When they are modified and saved from Oxygen XML Editor, the DITA map is updated automatically. Opens the DITA map in the main editor area with content from all topic references, expanded in-place. Content from the referenced topics is presented as read-only and you have to use the contextual menu action Edit Reference to open the topic for editing. Tip: If you want to print the expanded content, you should consider changing the Styles drop-down to + Print ready. For complex operations that cannot be performed in the simplified DITA Maps Manager view (for instance, editing a relationship table) you can open the map in the main editing area. Note: You can also use this action to open referenced DITA maps in the Editor. Show Profiling Colors and Styles - Select this option to turn on conditional styling. To configure the colors and styles open the Preferences dialog box (Options > Preferences) and go to Editor > Edit modes > Author > Profiling/Conditional Text > Colors and Styles. Show Profiling Attributes - Select this option to display the values of the profiling attributes at the end of the titles of topic references. When selected, the values of the profiling attributes are displayed in both the DITA Maps Manager view and in the Author view. Show Excluded Content - Controls if the content filtered out by a particular condition set is hidden or grayed-out in the editor area and in the Outline and DITA Maps Manager views. When this option is selected, the content filtered by the currently applied condition set is grayed-out. To show only the content that matches the currently applied condition set, deselect this option. Profiling Settings - Opens the preferences page for adding and editing the profiling conditions that you can apply in the DITA Maps Manager view and the Author mode editing pane. When a profiling condition set is applied, the keys that are defined in the DITA map are gathered by filtering out the excluded content. If you select a topic tab in the main editing area and it is referenced in the map currently opened in the DITA Maps Manager, the reference to that topic is selected in the DITA Maps Manager. If you have a map opened in both the DITA Maps Manager and the main editor, selecting the map tab in the main editing area opens that map in the DITA Maps Manager. If you have a map opened in both the DITA Maps Manager and the main editor (Author mode) and, selecting one or more topicrefs in the DITA Maps Manager will also select the same topicrefs in the main editor. If you have a map opened in both the DITA Maps Manager and the main editor (Author mode) and, selecting one or more topicrefs in the main editor will also select the same topicrefs in the DITA Maps Manager. Toggles whether or not the extended toolbar will be displayed in the DITA Maps Manager toolbar. Toggles whether or not the Root map option will be displayed in the DITA Maps Manager toolbar. Toggles how topics are presented in the DITA Maps Manager. If selected, the title of each topic is shown. Otherwise, the file path (value of the href attribute) for each topic is shown. Specifies a master DITA map (root map) that Oxygen XML Editor uses to define a hierarchical structure of submaps and to establish a key space that defines the keys that are propagated throughout the entire map structure. For more information, see Selecting a Root Map. Browse for local file - Opens a local file browser dialog box, allowing you to select a local root map. Browse for remote file - Displays the Open URL dialog box that allows you to select a remotely stored root map. Browse for archived file - Displays the Archive Browser that allows you to browse the content of an archive and choose a root map. Browse Data Source Explorer - Opens the Data Source Explorer that allows you to browse the data sources defined in the Data Sources preferences page. Tip: You can open the Data Sources preferences page by using the Configure Database Sources shortcut from the Open URL dialog box. Search for file - Displays the Find Resource dialog box to search for a root map. Opens the Insert Reference dialog box that allows you to insert references to targets such as topics, maps, topic sets, or key definitions. Opens the Edit Properties dialog box that allows you to configure the properties of a selected node. For more details about this dialog box, see Edit Properties Dialog Box. Opens a small in-place editor that allows you to edit the attributes of a selected node. You can find more details about this action in the Attributes View in Author Mode topic. Moves the selected node up within the DITA map tree. Moves the selected node down within the DITA map tree. Moves the selected node up one level to the level of its parent node. Moves the selected node down one level to the level of its child nodes. Opens a dialog box that allows you to choose a destination for exporting the DITA map. It also includes a Export as Zip archive option that allows you to package the DITA map as a zip archive. The result will contain all directly and indirectly referenced topics from the DITA Map by following all topicref, conref, and xref elements. Allows you to search for orphaned resources that are not referenced in the DITA maps. This action can be used to add the selected documents to a task in the Content Fusion Tasks Manager view. Oxygen Content Fusion is a flexible, intuitive collaboration platform designed to adapt to any type of documentation review workflow. This functionality is available through a pre-installed connector add-on. To fully take advantage of all of the benefits and features of Content Fusion, your organization will need an Oxygen Content Fusion Enterprise Server. For more information, see the Oxygen Content Fusion website. Opens the Fast Create Topics dialog box that allows you to quickly create multiple skeleton topics at once and you can specify their hierarchical structure within the DITA map. New - Opens a dialog box that allows you to configure some options for inserting a new topic. Reference - Inserts a reference to a topic file. You can find more details about this action in the Inserting References topic. Reference to the currently edited file - Inserts a reference to the currently edited file. You can find more details about this action in the Inserting References topic. Key Reference - Opens an Insert Key Definition dialog box that allows you to insert a targeted key definition (for example, to target a resource such as an image or external link). Key Reference with Keyword - Opens an Insert Key Definition dialog box that allows you to define a key and a value inside a keyword. A set of actions that open the Insert Reference dialog box that allow you to insert various reference specializations (such as Anchor Reference, Glossary Reference, Map Reference, Navigation Reference, Topic Group, Topic Head, Topic Reference, Topic Set, Topic Set Reference). Searches all references to the current topic in the entire DITA map. Allows you to change the name of a resource linked in the edited DITA map. Allows you to change the location on disk of a resource linked in the edited DITA map. Use this operation to rename a key. It also updates all references to it. Note that it does not work on DITA 1.3 key scopes. Use this operation to convert a DITA topic (of any type) to a DITA Concept topic type (for example, Topic to Concept). Use this operation to convert a DITA topic (of any type) to a DITA General Task topic type (for example, Task to General Task). A DITA General Task is a less restrictive alternative to the Strict Task information type. Use this operation to convert a DITA topic (of any type) to a DITA Reference topic type (for example, Topic to Reference). Use this operation to convert a DITA topic (of any type) to a DITA Task topic type (for example, Topic to Task). Use this operation to convert a DITA topic (of any type) to a DITA Topic (for example, Task to Topic). Use this operation to convert a DITA topic (of any type) to a DITA Troubleshooting topic type (for example, Topic to Troubleshooting). For your convenience, the last 5 XML Refactoring tool operations that were finished or previewed will also appear in this submenu. Opens the XML Refactoring tool wizard that presents refactoring operations to assist you with managing the structure of your XML documents. Opens the Find/Replace in Files dialog box that allows you to find and replace content across multiple files. Allows you to spell check multiple files. Allows you to paste content from the clipboard into the DITA map. Pastes the content of the clipboard (only if it is a part of the DITA map) before the currently selected DITA map node. Pastes the content of the clipboard (only if it is a part of the DITA map) after the currently selected DITA map node. Allows you to expand the entire DITA map structure. Allows you to collapse the entire DITA map structure. Opens the selected resource in the editor. Opens a dialog box that allows you to configure options for converting the Markdown document into a DITA topic. Use this operation to extract editable topics into a new DITA map. The operation will open a map creation dialog box where you can select the type of map and configure the title or file name. Click Create to complete the operation and a new DITA map will be inserted at the location where the action was invoked with the selected topic references moved into the new map. Use this operation on topics that contain nested <topic> elements to convert each nested topic to a new topic. Also, the new topics are added in the DITA Maps Manager as the first child topics of the original topic. Use this operation on topics that contain multiple sections to convert each section to a new topic. Also, the new topics are added in the DITA Maps Manager as the first child topics of the original topic. Deletes the currently selected node and copies it to the clipboard. Copies the currently selected node to the clipboard. Deletes the currently selected node from the DITA map. This action can be used to remove the selected resource(s) from disk. Selecting this action will open a confirmation dialog box where you can also choose to remove the descendants by selecting the Also remove all descendants option. If you proceed, a search for references is triggered. If multiple references are detected for any of the selected resources, you will have the option to review them since this would lead to broken links. Move Up - Moves the selected node up within the DITA map tree. Move Down - Moves the selected node down within the DITA map tree. Promote(Alt + LeftArrow) - Moves the selected node up one level to the level of its parent node. Demote(Alt + RightArrow) - Moves the selected node down one level to the level of its child nodes. Opens the currently selected DITA map in the editor. 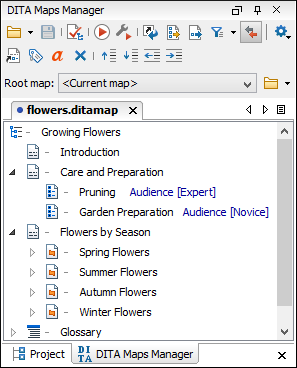 Opens the parent DITA map of the currently selected reference in the DITA Maps Manager. Allows you to change the profiling attributes defined on the selected node.